Hi all, welcome to my very first blog post. Firstly, happy Mother's Day to all the mums. We deserve it don't we? 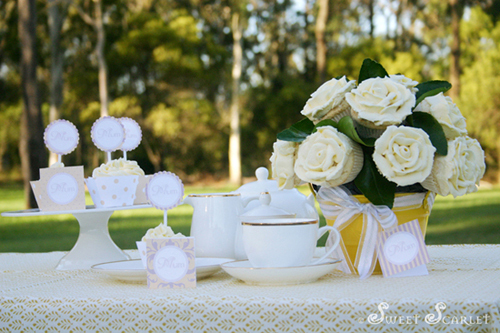 Here is a High Tea Party for Mother's Day that I put together. Enjoy and watch my blog for how-to-tutorials to come this week. I do adore afternoon tea. And it was a beautiful afternoon. The light was amazing. 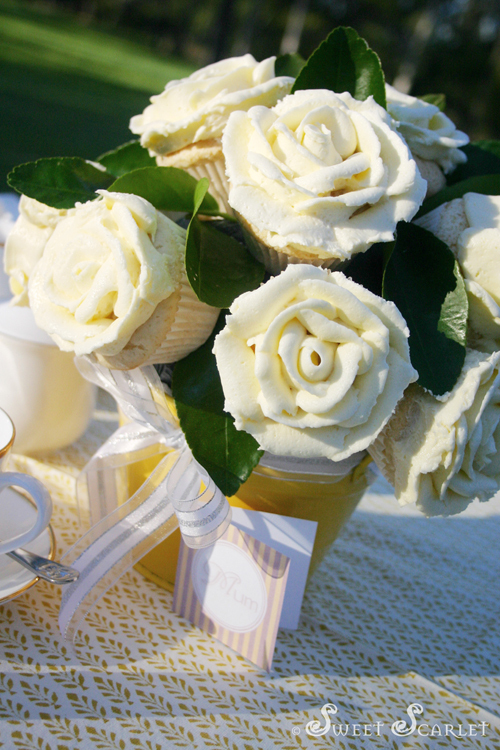 Stay tuned, I will be posting a how-to-tutorial on this Cupcake Bouquet this week. 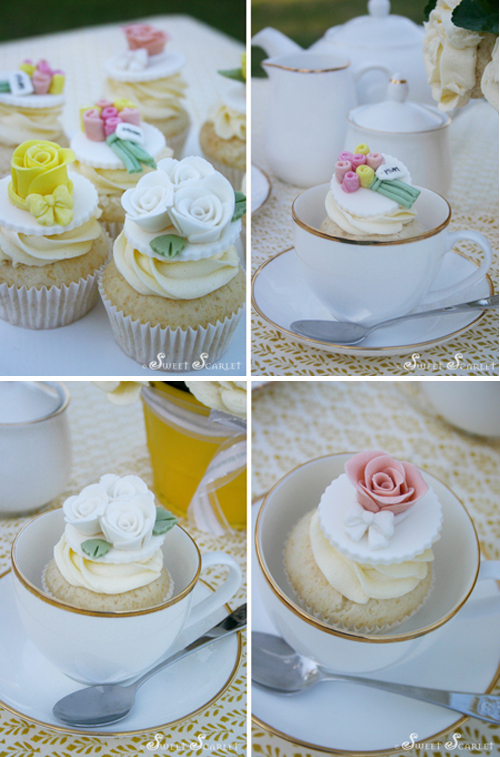 All you need to make these pretty gumpaste roses is a small round cutter. I thin the edges of the petals between my fingers, no need for ball tools or forming mats. FREE! 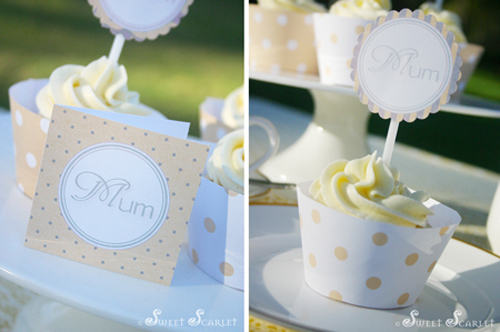 Sweet Scarlet DIY Mother's Day Gift Tag & Party Dot Printables. Mother's Day Gift Tags & Party Dots. Thanks so much for viewing my first ever blog post! Bungalow Hand Block Print Tablecloth from The Brown Trading Co. 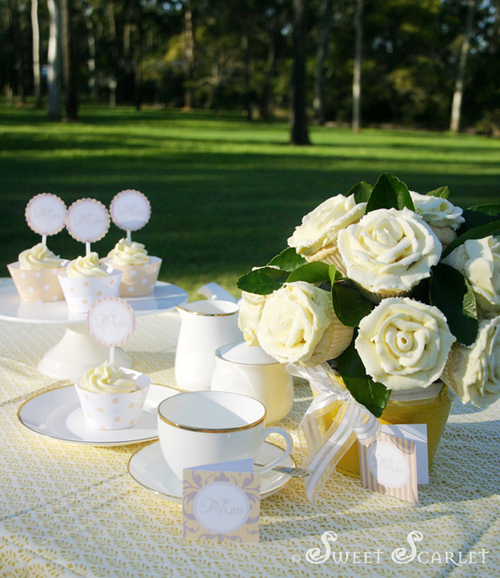 Thank you so much for posting about our tablecloths, they aren't through The Cupcake Courier though they are through our other business which is wholesale The Brown Trading Co. Just in case any one was looking for them on our Cupcake Courier website hehehe. Looks like a stunning Mother's Day - beautiful! Beat the (room temperature) butter with an electric mixer until pale, add 2 cups confectioners sugar, 1 tablespoon milk and the cream of tar tar & vanilla. Beat thoroughly. Alternate confectioners sugar and milk, beating in 2 cups of sugar at a time until all sugar is used and you are happy with the consistency. If buttercream is too soft, refrigerate it for 5 minutes before piping. le goudron en france ca se m'est sur les route. est les haricots c 'est des legumes. je pense que les mots change quand on les traduit merci encore . Here is an explanation of Cream of Tartar, also known as "salt of tartaric acid": Cream of Tartar can be used to give a creamier texture to sugary things like cake frosting and to stabilize and increase the volume of beaten egg whites. Use vanilla extract to flavour your buttercream. It is OK to omit the Cream of Tartar, the buttercream will be fine. Your rose cupcakes are gorgeous! I'm still trying to get the hang of buttercream roses, these are definitely inspiring. bonjour Elise merci pour la recette c'est super. alors a quand de nouvelle photos a tres bientot le bonjour de la france a bientot nicole. bonjour elise alors a quand de nouvelle photos? Hi Anonymous. New tutorial on Gumpaste Roses later this week.